CO2control: essential for good results. Aeration of the substrate bags is essential to control the CO2 level in the substrate. The quality of the micro perforation is extremely important for optimal air exchange. Heat emission also plays an important role. With too large a diameter of the bag, the substrate soon becomes too hot, causing the mycelium to die off in the centre of the bag. Preference is given to hanging substrate bags. Excess water can flow away so anaerobic conditions are avoided. Competing moulds at the bottom of the bag are given much less chance to grow, because the conditions remain optimal for the cultivated mycelium. Unintentionally, the first mistake is often made when the spawn is delivered. At the moment the spawn arrives, the temperature must be measured immediately. Warm spawn is already very active and produces a lot of CO2. This is soon too much CO2 for the built-in filters, causing the CO2 level to rise too far. Fast and refrigerated transport is therefore essential. Cool the spawn as soon as possible after delivery to decrees the activity of the mycelium. Spawn comes in bags with a filter. These filters provide just enough gas exchange for storage of the spawn at a low temperature (just above 0 °C). At higher temperatures, the activity of the mycelium soon increases and therefor also the CO2 production. The air permeability of the filters is not sufficient for this. So make sure that the stored bags do not touch each other for optimal cooling and never lay the bags on the filter. Especially Oyster Mushroom mycelium produces CO2 at low temperatures. The CO2 content in the refrigerator will therefore also rise, as a result of which the air exchange between gas in the bag and the air in the cooling will be reduced further and further. This makes the mycelium less and less powerful because it is "poisoned" by the CO2. Inoculation with this badley treated spawn will certainly cause problems. 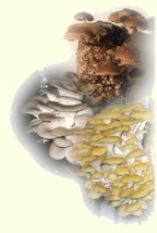 Growth of the mycelium in the substrate will be significantly slower, giving other fungi the chance to grow. Opening the cooling once daily, even if only for 10 seconds, ensures sufficient ventilation. Strange and unknown cultivation problems are often caused by this first mistake!